If you had walked down Zelazna Street in Warsaw prior to 2012, it is unlikely you would have noticed a narrow alley next to #74. 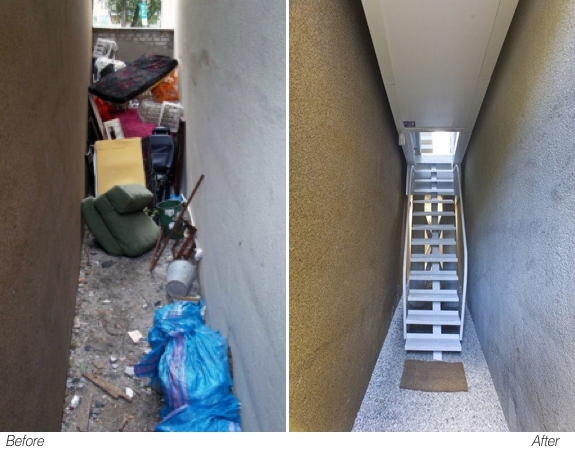 Like so many throughout the Polish capital and other large cities, the unremarkable alley smelled of urine and was used by local residents as an unofficial garbage dump. Today, if you were to walk by that same alley, you won’t see any trash bags or discarded furniture. But you would see a staircase. An oddly-located staircase. Were you to think about it you might wonder why the staircase were there. But you would probably not guess that it leads to someone’s home. That someone, it turns out, is an author named Etgar Keret (who, among other works, wrote The Bus Driver Who Wanted To Be God & Other Stories). 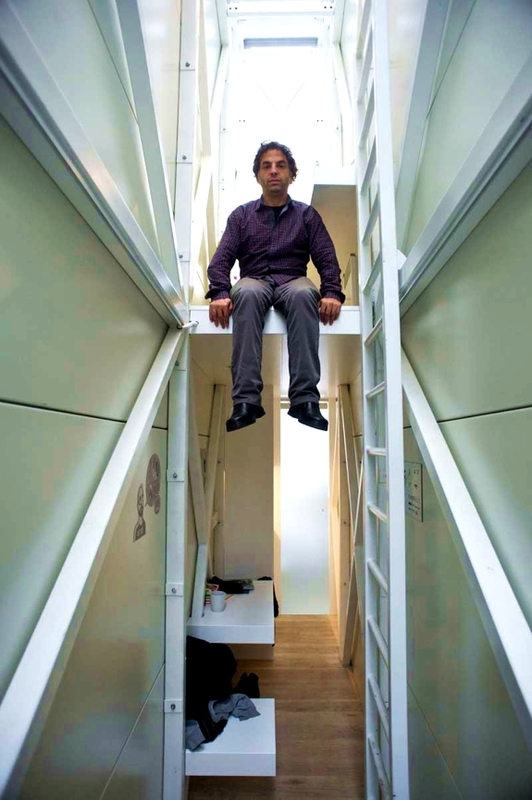 Keret lives in the most narrow house in the world. How narrow is it? Inside, the house is 122cm (48 inches) at its widest point — and 28 inches at its narrowest. People standing in the middle of the house can simultaneously touch both outer walls with their elbows. And yet there’s enough room for a bed, desk, kitchen and bathroom with sink, toilet and shower. What there isn’t enough room for is an internal stairway. Those stairs you see from Zelazna Street lead to a door that’s built into the floor for the first story. The way up to the two stories above that are traversed by ladder. With 14 square meters (150 sq. ft.) of internal living space, The World’s Most Narrow House is not large enough to qualify has a residence under Polish law. So, legally, the house is classified as a temporary art installation. The installation was designed primarily for the aforementioned Etgar Keret (shown in the photographs on this page) who chose the location himself. On one side of what’s often referred to as the “Keret House” is an apartment building constructed before to WWII. On the other side is a co-op constructed after. Keret, whose mother survived the holocaust but whose father did not, appreciated the symbolism of the location. When Keret isn’t in the house he often invites other writers and intellectuals to stay there and become inspired by the creative space. Despite being wedged between two large concrete buildings, the Keret House is full of natural light. Some comes in from the two front windows but most pours through the roof which is made from a special, semitransparent plastic. The Keret House was constructed entirely off-site and then slid into place using a special crane imported from Germany. The house is currently scheduled to be removed in 2016. If it doesn’t find another home after that, the title of the world’s slimmest house will revert to an abode nicknamed “The Wedge House” located on the Scottish island of Great Cumbrae.